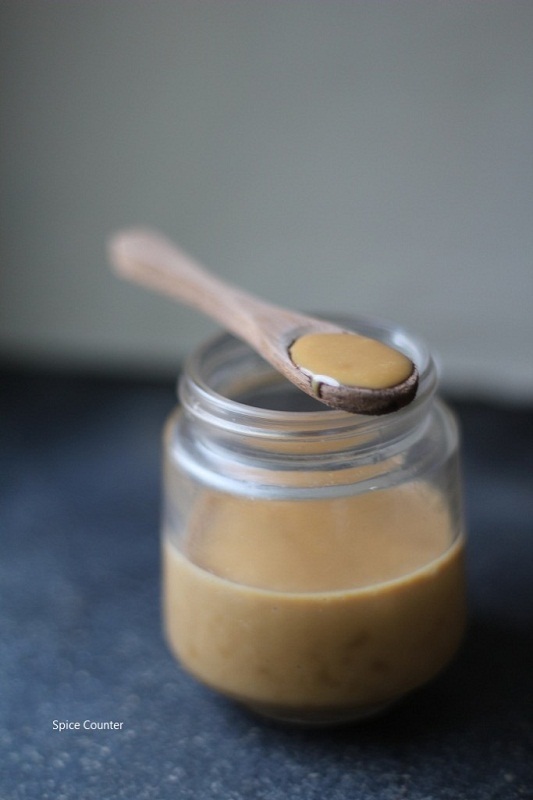 While i was going through this blog called Divine Taste a couple of months back, i came across the recipe for Dulce de Leche (pronounced “DOOL-se de LE-che) which caught my attention. Dulce de Leche is prepared by cooking condensed milk giving it a caramelized flavor. It seemed very tempting so i bookmarked the recipe immediately. Dulce de Leche can be used to make banoffee pie, to flavour ice cream & frozen yogurt and can also be drizzled over crepes, pancakes, waffle etc. There are several ways to make Dulce de Leche, pressure cooking seemed the easiest method with the lowest cooking time so i decided to go with that. A lot of bloggers have written about the risk of the explosion due to the steam that is built up in the can. I was so worried about it and was walking around in the kitchen with a pan as a shield. However, my fears turned out to be unfounded. Still, to be on the safer side, i left my pressure cooker untouched overnight. All those who are afraid to use the pressure cooker method to make Dulce de Leche can make it using the oven, which is also an easy method. Pour one can of the condensed milk onto a glass baking dish. Cover the glass baking dish with an aluminium foil. Place this dish on a larger baking dish and add hot water to the larger baking dish till it reaches halfway up the side of the dish. Place this in a preheated oven and bake for 60-75 minutes at 220° C. Check the water level in the dish a few times during baking and add water as when required to keep it at the same level. Once the Dulce de Leche is nicely browned remove from the oven and let it cool. 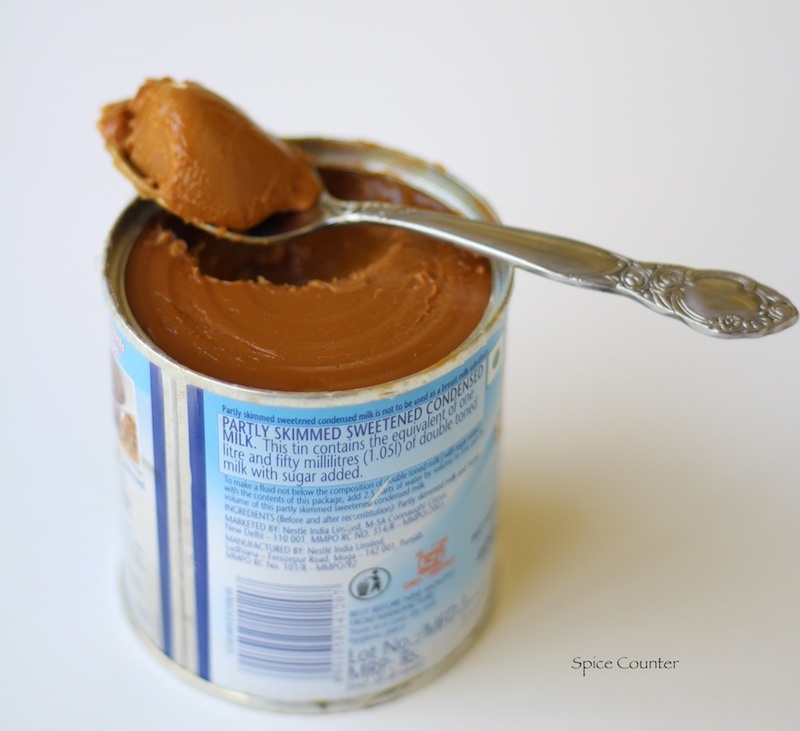 Check out Bakers Royale for other methods of making Dulce de Leche. If the Dulce de Leche is too thick, take the required quantity of Dulce de Leche and mix it with milk and microwave it for 15-20 seconds . Place the condensed milk can, after removing the label, (unless it is printed on the can) in a pressure cooker sideways. Fill the pressure cooker with water sufficient to cover the can. Close the lid and cook it on high heat till the pressure cooker releases steam. Simmer and place the weight on the pressure cooker. Steam the condensed milk for 30 minutes after simmering to get a deep caramel coloured Dulce de Leche. Wait till the can and its contents are completely cool (Ideally overnight) before you open the lid. Store in the refrigerator until ready to serve. When kept tightly covered and refrigerated, the Dulce de Leche should last a month. To get a caramel coloured runny Dulce de Leche, you can reduce the cooking time from 30 minutes to 15-20 minutes. WOW!!! Never heard of this.. Sounds very very tempting.. Thanks for the detailed instructions….